It’s obvious that you would love Google talk but your friends are interested in Facebook chat or the Yahoo chat and evolution of so many instant messengers have let a way for multi messengers to make their way in allowing users to have all these chat application on a single platform. When you have so many messengers, it makes sense to have a multi messenger instead of installing dedicated Android application for all those. 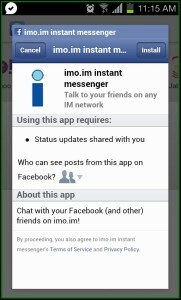 Right now if you go and look for a multi messenger application you will still find as many as half a dozen of application. 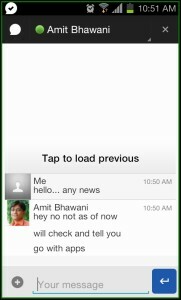 Multi messenger clients like Nimbuzz, pidgin, Trillian, Adium and IMO messenger are available. 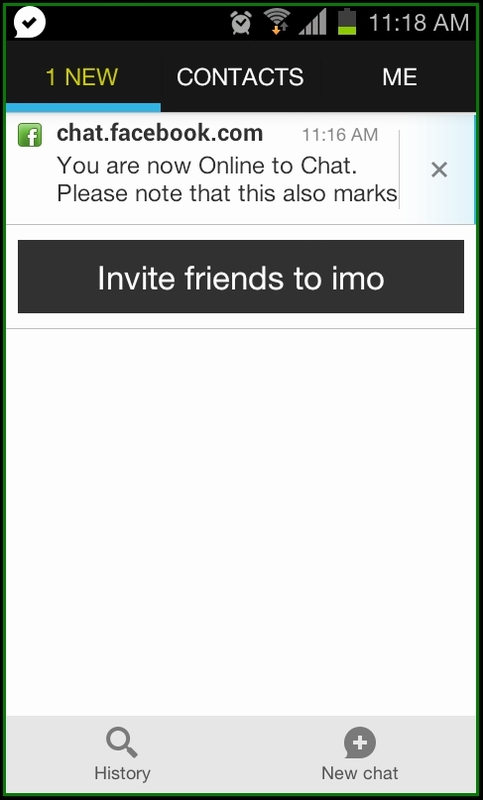 The IMO Instant messenger allows you to easily get in touch with your friends on the existing instant messenger applications. 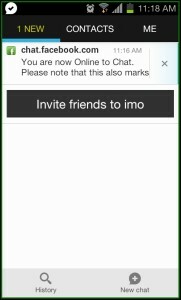 Whether you are using Google talk, Skype, Windows Live Messenger or any other famous services then IMO instant messenger on your Android powered smartphones or tablets would be an easy go to cater chatting needs of yours. IMO messenger doesn’t charge you for anything instead it make use of your data connection and even 2G with EDGE will do it for you but 3G, 4G, LTE certainly makes the quicker and good response. 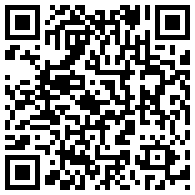 IMO application is available for web, Android, iOS, BlackBerry and Nokia powered smartphones platforms. 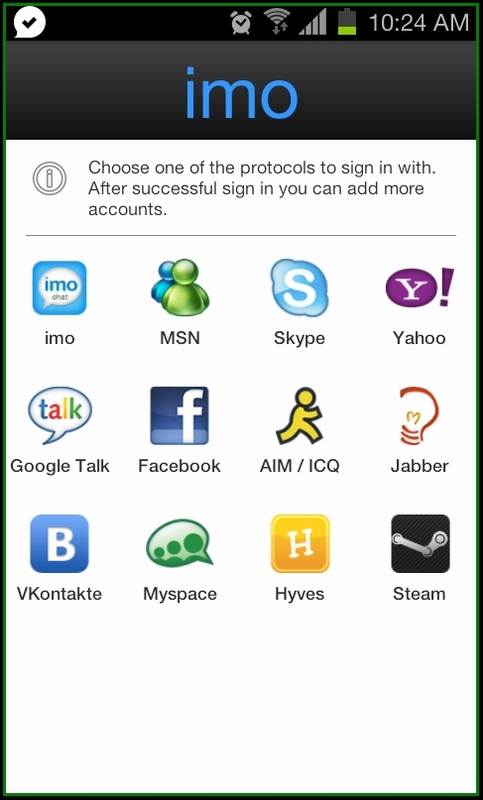 As soon as you install this application and run it on your mobile phone, you will see the IMO home screen where in you have all the shortcuts to IMO, MSN, Skype, Yahoo, Google Talk, Facebook, AIM/ICQ, Jabber, Vontakte, MySpace, Hyves, Steam messengers. 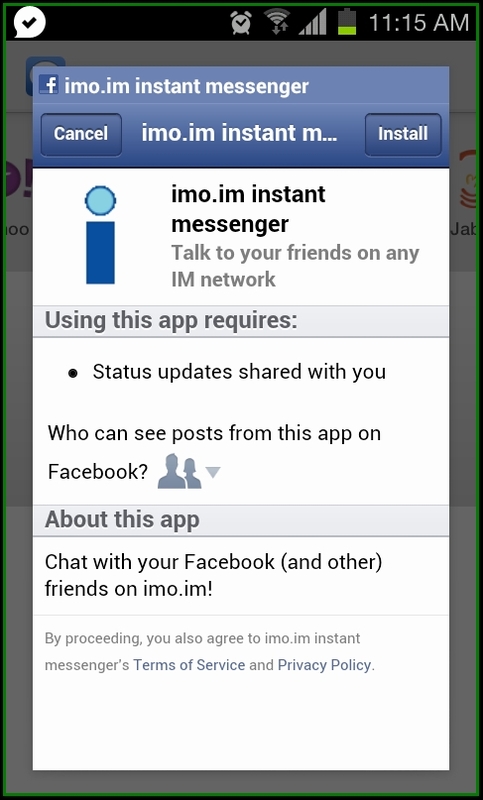 I think you are aware of the remaining other messengers like Skype, Google talk, Facebook, Jabber, MySpace and MSN but IMO in particular is the special messenger from the team of IMO.im. 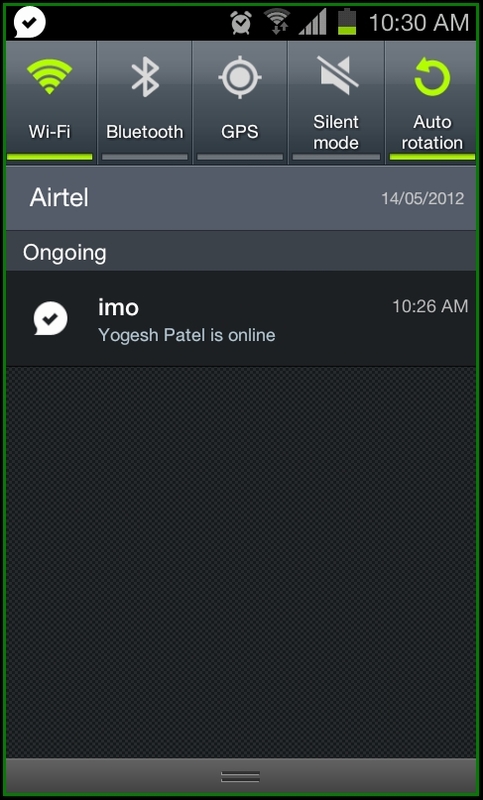 You need to separately signup for the IMO in particular to make use of the IMO messenger. 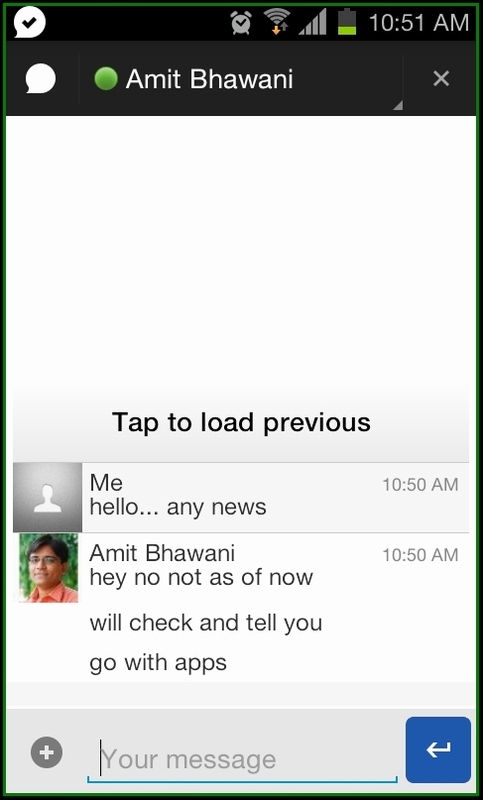 When you tap on Google Talk you would be able to sign in with the Google Talk messenger. But for the first time you need to provide the login of your Google Account and once you do that you are through. With Google Talk at IMO Messenger apart from text chat you can search for contacts, add contacts, chat group with your friends. 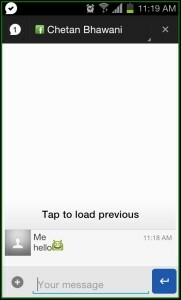 You can tap on the Android.imo.im and this will allow you to update your status. 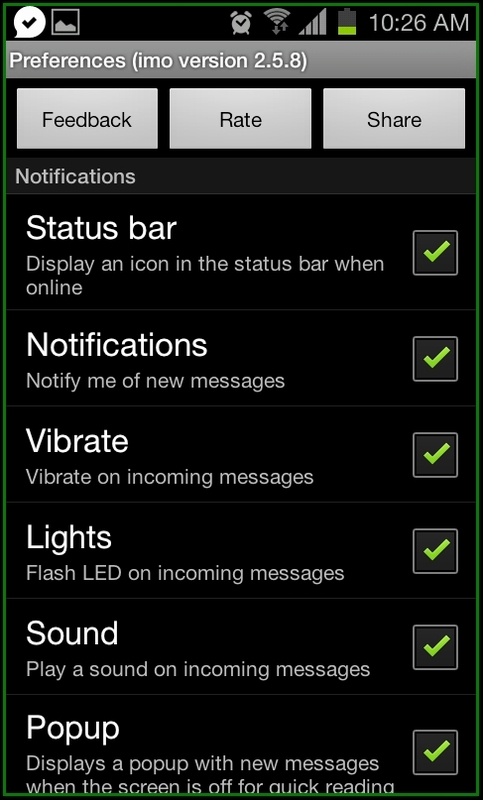 Just on the extreme side of your status bar you can show the icons of available, busy or away. 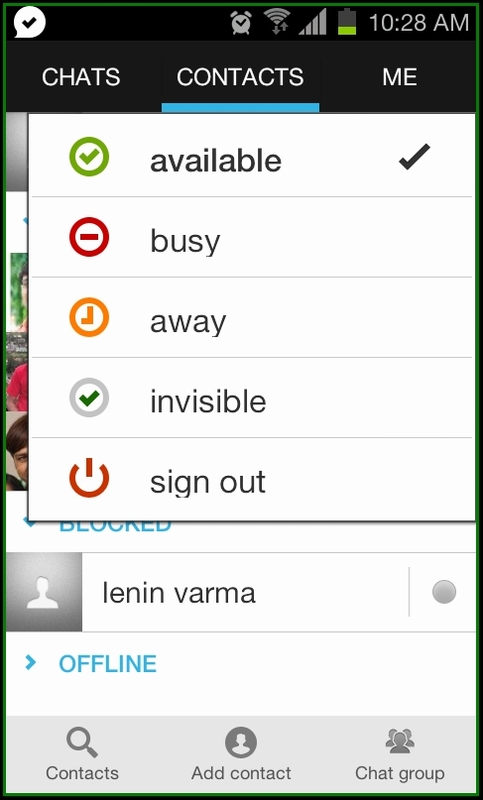 The option of invisible and sign out counts it all to make the Google talk integration as simple as your desktop version and its par better than the default Google talk on your Android smartphones. 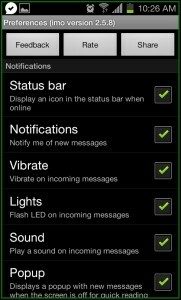 Finally there is Me tab allows you to go through various settings of status bar, notifications, vibrate, lights, sound, popup, sleep mode customization, save passwords, auto start, auto away, chat history, nobuddy IMs, change the font size, buddy icons, emoticons. 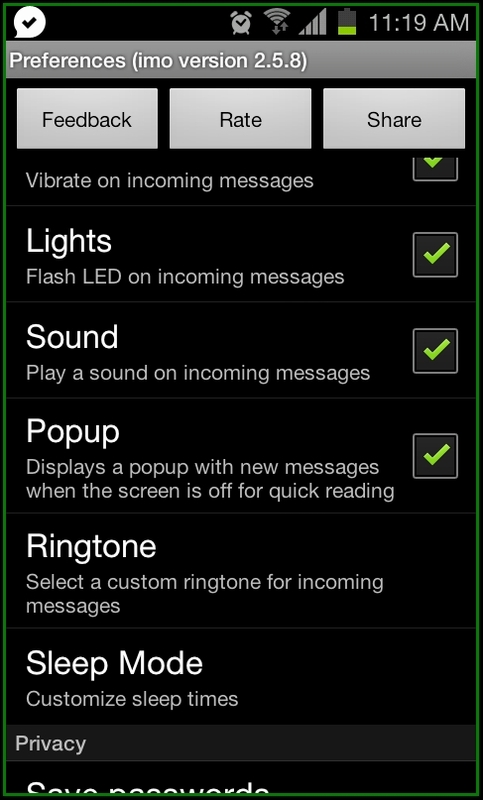 Ringtone: For incoming messages you can customize a ringtone and you would be taken to the default Android ringtones. 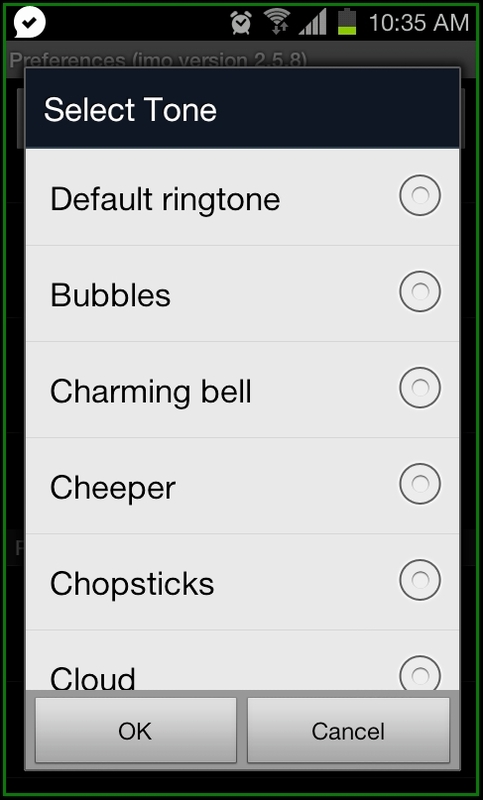 Alternatively, users can add their own customized ringtones in the ringtones folder as well. 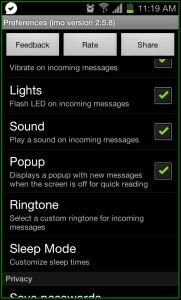 Sleep Mode: The sleep mode here will allow you to off the new messages notifications without any sound but they will be delivered. Sleep mode starts at a particular time provided by the users and ends on the particular time. 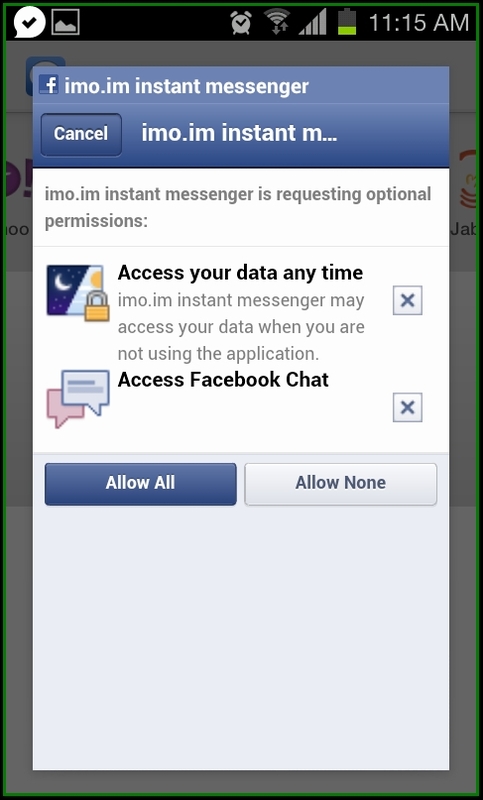 As soon as you tap on Facebook Chat on your mobile phone, it will ask for permissions. 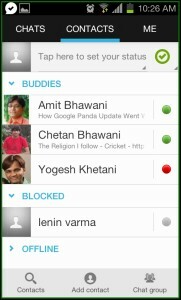 Once you do that you are on to Facebook Chat with your friends who are online listed. 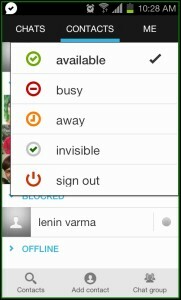 The interface is similar just like Google talk with update status, search for contacts, add a contact, create a chat group. IMO messenger also stores the chat history of Facebook Chat application accessible directly on to your contacts tab. 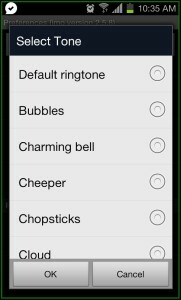 The same settings of Ringtones, sleep mode sound, lights, playback are available here too. The similar interface goes with the various instant messengers like Skype, Yahoo, MSN, ICQ, Jabber. To add another IM account, you need to tap on the ME and then tap on the Add account. 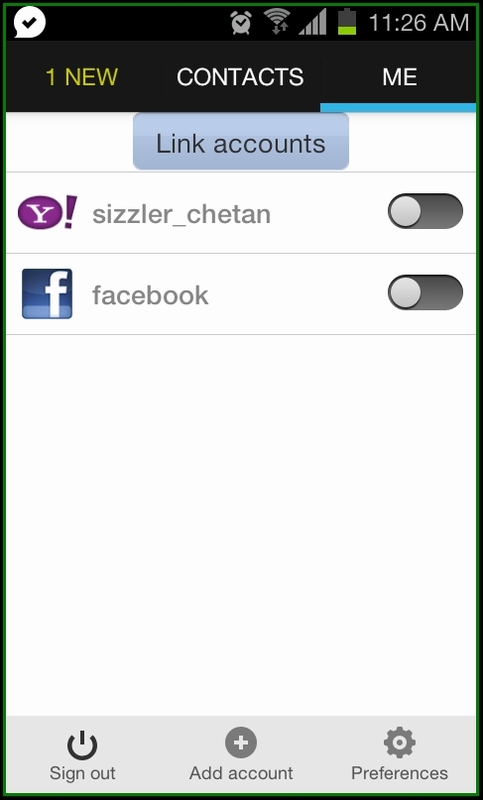 This will take back you to the home screen interface of IMO and here you need to tap on any one which you would like to add to the list of the linked accounts. 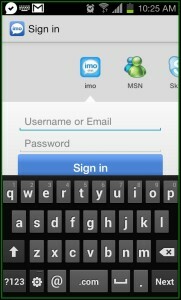 Once when you have linked account, you can easily sign in and sign out with single tap on it. 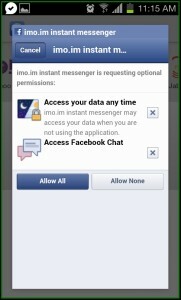 IMO Instant Messenger Android application can be easily downloaded from Android Apps Labs for free. 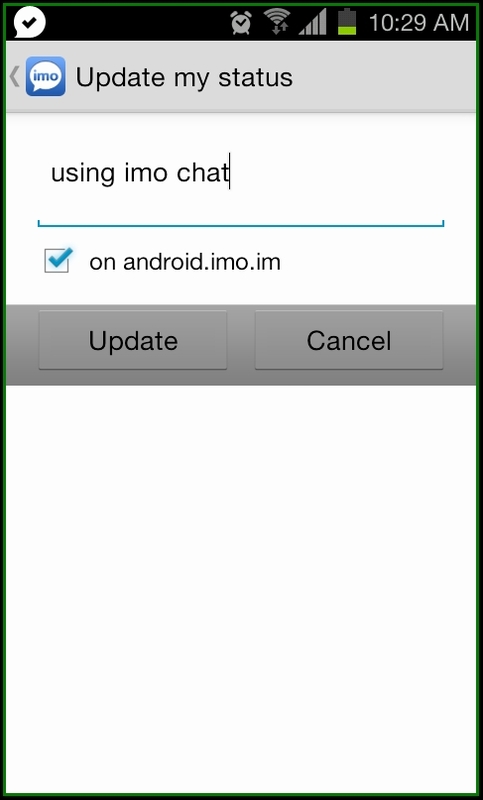 To download it directly on to your mobile phone, you need to visit the Android Apps Labs page listing of IMO Instant Messenger application from your phone’s browser and then click on Install to automatically proceed with the installation. 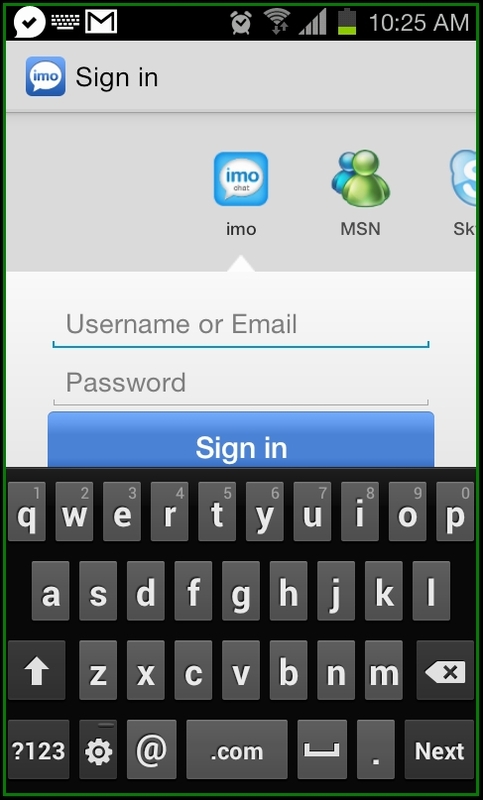 The IMO Messenger is among the widely used application not only for Android powered smartphones but also for various platforms. The interface as the first time user is not easy and it can take time to understand on how you can add multiple accounts on single client. It recommended and its rated as the best multi messenger clients.